"A good use for leftover rice. Can be served hot or cold." 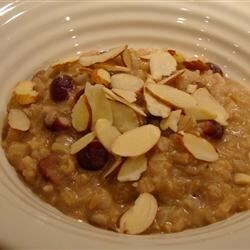 Combine rice, soy milk, raisins, almonds, maple syrup, cinnamon, and cardamom in a saucepan; bring to a boil over medium-high heat. Reduce heat to low and simmer, stirring frequently to prevent scorching, until thickened, 5 to 8 minutes. Spoon into 4 bowls. Make this easy yogurt fruit bowl! Use white rice if preferred. Substitute other nuts for the almonds if desired. If you don't have leftover cooked rice, cook 1 cup brown or white rice in 2 cups water for 45 minutes or 20 minutes, respectively. I loved this!!!! I only used 3T of maple syrup. It did require addtional soy milk as it was kinda dry, but no big deal to add that as you cook it. Loved it!